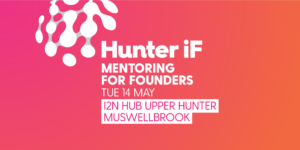 Hunter iF is hosting a series of events across the Hunter region to demonstrate the power mentoring has on the development of a vibrant innovation ecosystem. Join us to hear fast-paced and engaging presentations by local mentors and mentees on their experience and insights, including tips for effective mentoring, rules of engagement, making the most of sessions, scheduling meetings and following-up on deliverables. A networking session for all attendees will follow facilitated by a specially designed app that will match you up with the expertise you can impart as a mentor, or you are seeking as a mentee. Hunter iF is proud to bring this event to you in partnership with the University of Newcastle’s Integrated Innovation Network (I2N). Hunter iF’s mission is to harness our region’s immense potential to help create a more innovative future. Established as a not-for-profit organisation, Hunter iF encourages and facilitates investment and economic growth within our region by providing comprehensive and connected services that complement existing programs and opportunities. UON is proud to be able to bring this event to you via the NSW State Government’s Local Innovation Network Program.